Chapters 5 and 6 look pretty bland on the colour palette. That’s not to say they aren’t exciting, but it isn’t a very inviting place. 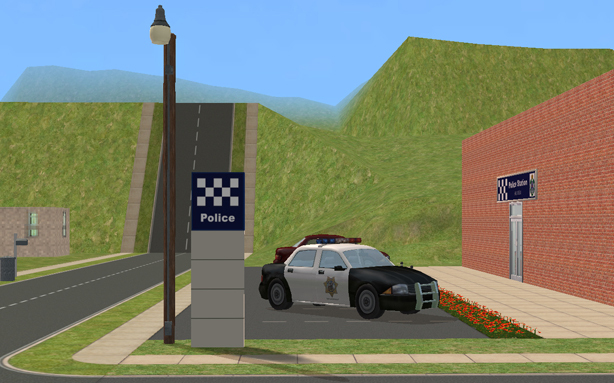 Damien finds himself being questioned at the local police station in Hillview. 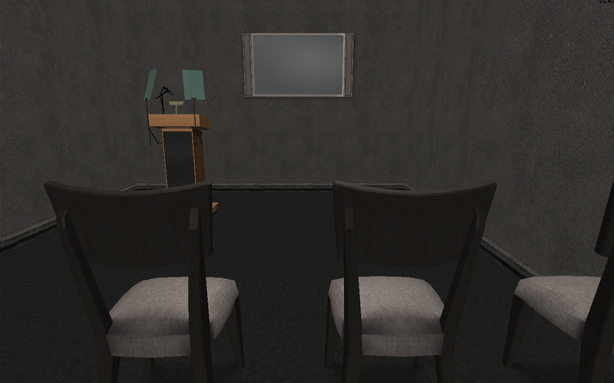 The set was not as simple as it looked, because while Chapter 5 you may only see a tiny little blank interview room, around it I had created the whole station – which should hopefully be featured in later upcoming chapters, so hopefully it wasn’t an entire waste! I was very proud with what I eventually came up with, so I thought I would share with you some photos of the whole lot. 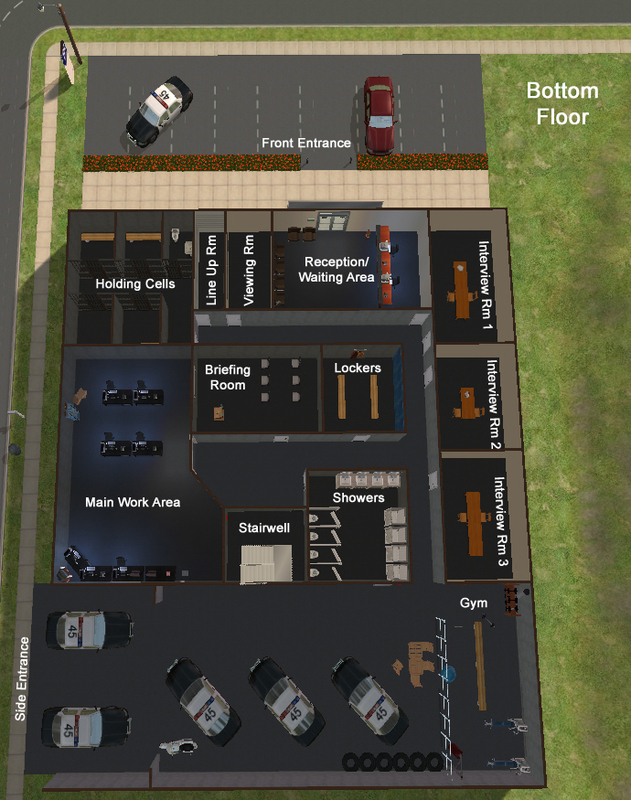 It is 2 floors, although admittedly I haven’t done anything with the second floor just yet, but it will have a small tea room surrounded by many indivual offices… and well, anything else I can come up with. 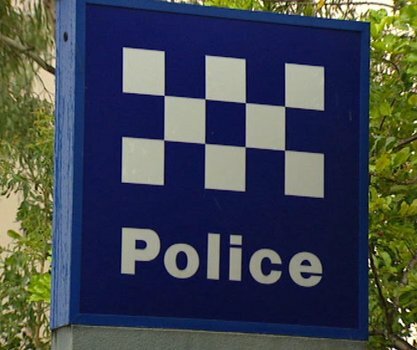 The station was inspired by the one seen in Australia’s police drama, Rush. It is depicted in greys and it’s a very kind of dull-looking place to be, which is evened out by the extra excitement of day to day activities. Although you may see a few of the rooms on the show, it was all very much guesswork , especially the floor layout. 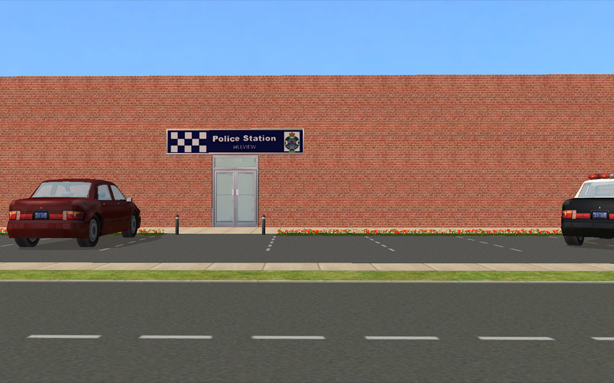 The sign was a recolour of MogHughson’s Illuminated Shop Sign, and the 1-wall column logo thing were both modelled off the police stations we have over here. I seem to have misplaced my original reference picture, but here’s another for the wall. So that was a really simple wallpaper to recolour, and is only intended to be 1-wall length. Front entrance (apparently I need to do something about the neighbouring hill O_o) with red poppies and decorative park spaces. Side/workers entrance (which is really the front, hence vehicles can enter driveway. This area has been left open because I couldn’t see cop’s opening and closing garage doors everytime they had to rush out, although this leaves your visitors wandering up hallways and ringing doorbells at the main work area. There are two park spaces for drivable cars, the rest are model cars). 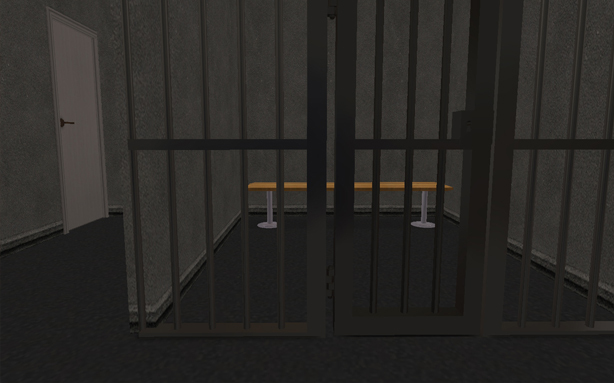 Holding cells (as these are only meant as temporary means, individual cells do not contain toliets). Main work/collaborative area with individual desks and one big work station (again inspired by Rush). It’s not bad if I do say so myself… I tried and tried to fit everything in nicely and as logically as possible. 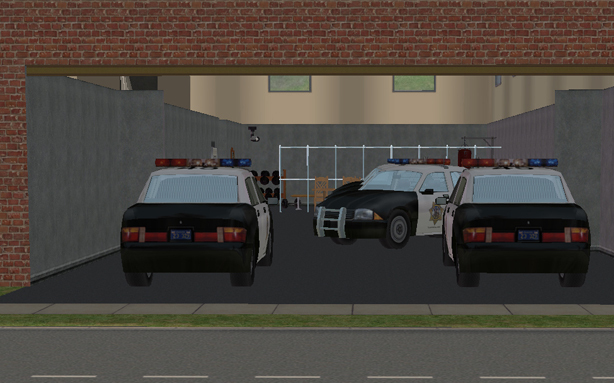 I couldn’t see suspects being dragged into cells or interview rooms that were on the second floor, and I really wanted a large open work area, along with the garage and… well, everything else. It is my most expensive lot to date (that said, I haven’t really made all that many lots) and will consider making it available to download if there’s any interest. 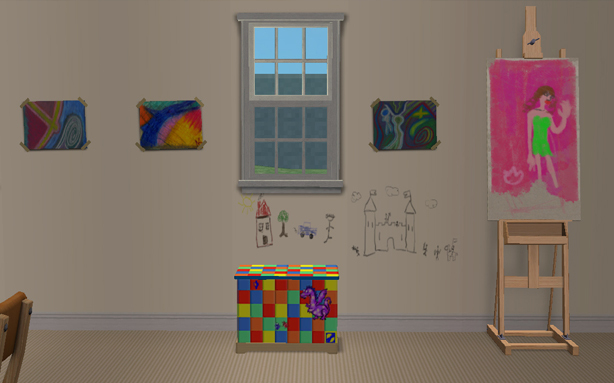 🙂 Once again, wouldn’t be possible without all the lovely custom content available from Mod the Sims, etc. Thank you! The thing about the park, or Wyatt Reserve as it’s so named, is that it was built on the edge of a cliff. 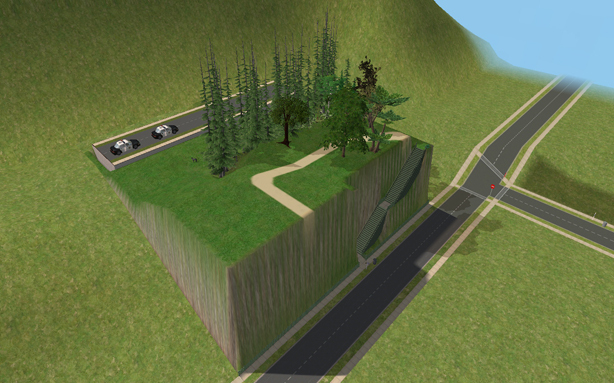 I can’t remember why exactly I chose it to back onto the side of a mountain, possibly because I wanted a lot already slightly built up that I could work from because I knew this lot was going to have a hill, and perhaps because the suburb is called Hillview. Whatever it was, the lot was certainly built up, and I spent forever trying to get the right look to the ground levelling and putting in the right heights. Once I had my park looking how I wanted it ready for when Damien arrived on the scene, I then altered it to fit in the extras, and change around the scenery to look like it was in a different section of the park. People are seen playing and talking, and people are seen leaving. This was to indicate it was late in the day (getting on 5.30pm) and people were leaving for home. This was filmed and undone, so I was back to my clean slate for Damien’s arrival with his beloved friend and companion, Pepper. 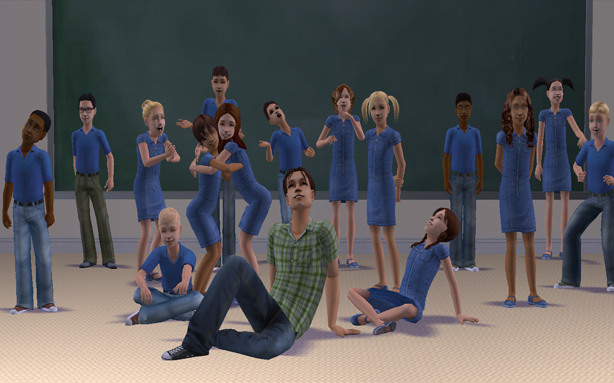 He is seen wearing the same clothes he wore in Chapter 1, also indicating it is the same afternoon, after he’s finished up at school with his teaching. There were 2 extras – a mother and daughter – that didn’t make it to filming as pictured below. 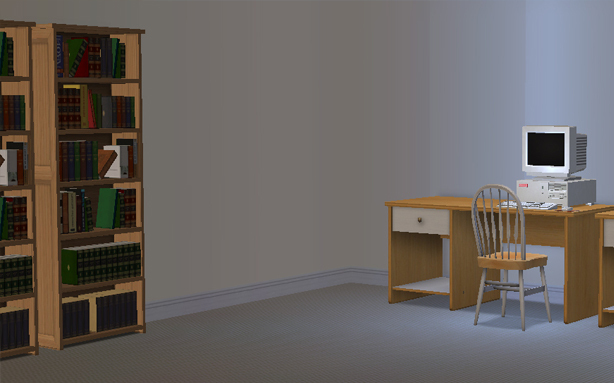 All the sims were given a cosy little area in which they could do whatever they liked (had I given them the chance to do so. Gotta love turning off their freewill). 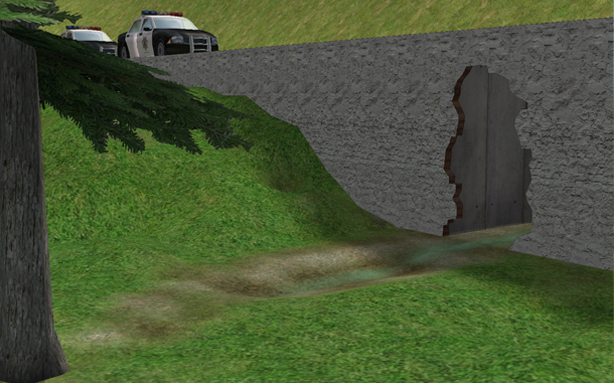 This was hidden underground, which comes to my proud creation of: a fake road. In the story, Damien wanders off the usual path and down a hill, following the sounds of a young child screaming and angered voices. 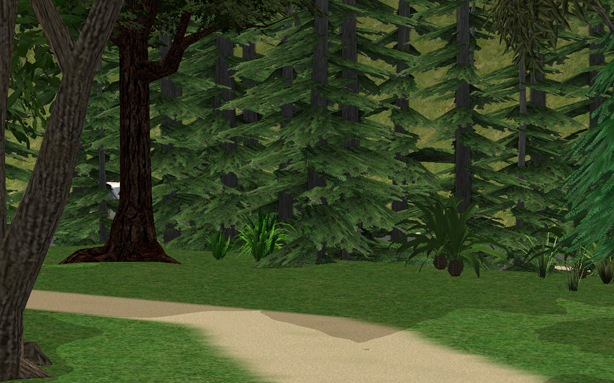 He hides in the cover of the trees, looking out onto the situation as it unfolds. The boy is being held against the inside wall of a large (unused?) drain pipe, which creates a tunnel under the road. 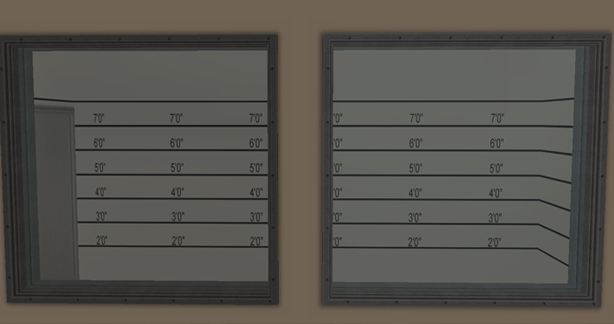 I tried and failed to find a rounded door, wall or archway compatible with my game, and so contented with a rather broken, corroded looking one. It is a tell-tale point that is part of the park isn’t one usually ventured upon by the public. It is dirty, it has grafitti on the inside and some leftover pipes. The drain itself is pretty dry, it’s bottom covered in pebbles and just a thin trickle of dirty water which blends into nothing. But I was most worried about the road. The cars needed to be seen arriving on top of the fake road, so the police could jump down off the little edge and race down the hill to confront Damien. Sims can’t drive on fake roads. And they certainly can’t leap off the ledge of a wall. So I used an obstacle course animation and I put in some decorative cars. And started on a second lot – making sure it also backed onto the side of a mountain – so I could film cars entering and leaving the lot, and make it look like they were using the fake road atop the drain. Pretty tricky stuff! This is why you see the cars arriving with lights and flashing sirens (after quite a number of prank calls to the cops) and upon confrontation, all lights go off. 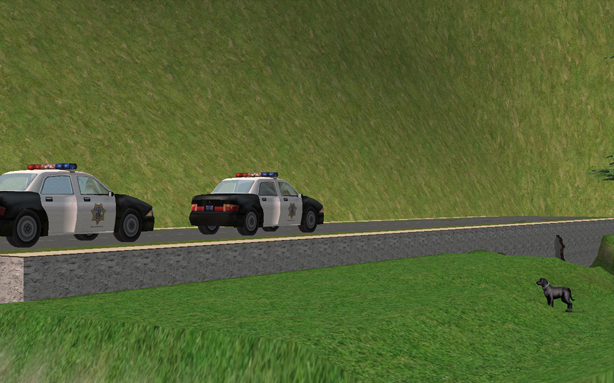 This is because the prop cars didn’t have working sirens (okay. So my sims like to save power. They aren’t in the cars anymore, of course they’ll want to turn off all the lights). They are then seen leaving with lights, but no sirens (they’ve caught the culprit, there’s no rush anymore ;)) and this is thanks to the driveable cop car from VampCat. And the biggest thanks to Maxis and Numenor’s game add-on: Drivable Cars without Nightlife. I also fell in love with these trees which suited my needs perfectly – large trees, close proximity – hide n seek in the forest! Although I assure you, usually the park is a pleasant place to be. Damien and Pepper spend many afternoons there, just enjoying each others company. The opening chapter of Innocence primarily serves to introduce the main character and how he interacts with those around him. To do this, I thought it would be a lovely idea to show Damien’s life as a teacher, and how much he loves his job. 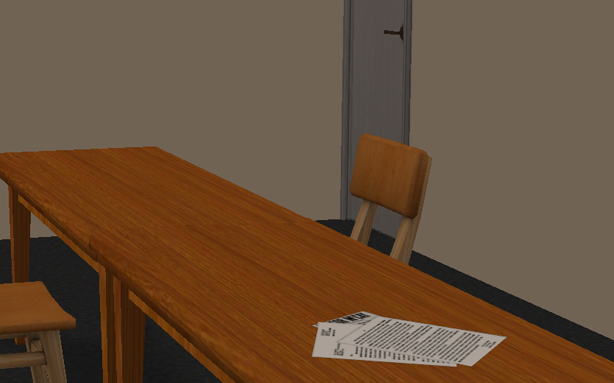 I wanted to create a friendly, welcoming atmosphere, partly inspired by the classrooms I had as a kid. I put the desks into groups rather than rows so the students could be seen working together with friends and just generally enjoying each others company. The students in the story are seven year olds in Grade 2 and they have all learned to love their caring, sympathetic teacher who plays a role model, fatherly figure for some. There were 22 desks, intended for 22 students, however leaving room for absentees, and to cut short on filming time, I only created 15 of these students. 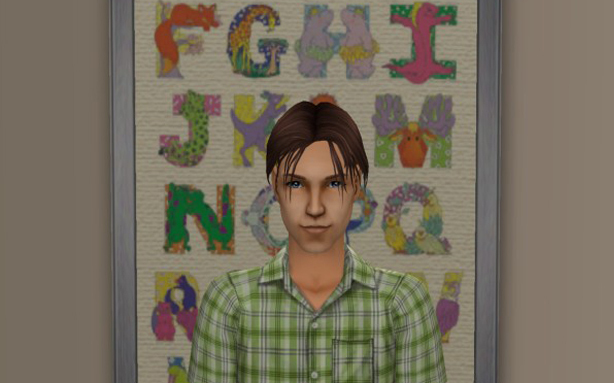 For the first and last time, I had created and personalised a family of eight, to which I then added random sims via the Tombstone of Life and Death. 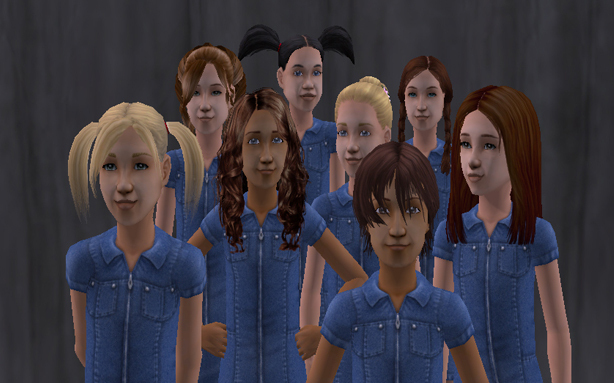 I continued to customise these, but was disappointed to find unreplaceable Maxis eyes on all of these extra students. They didn’t look so bad, but I avoided filming close ups of them. Never the less, it’s still all a part of the learning curve and from this point on, I’ll be customising every sim that appears in the story. 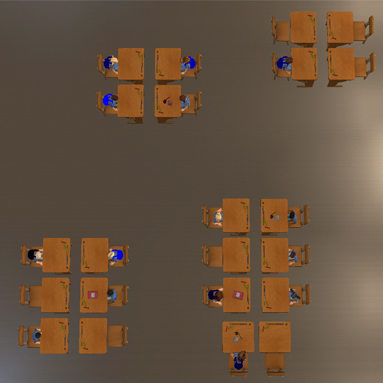 I also had the problem of the “flashing blue” custom objects each time I loaded the lot, so I had the pleasure of rechanging the appearance of 9 or 10 students each time it loaded. 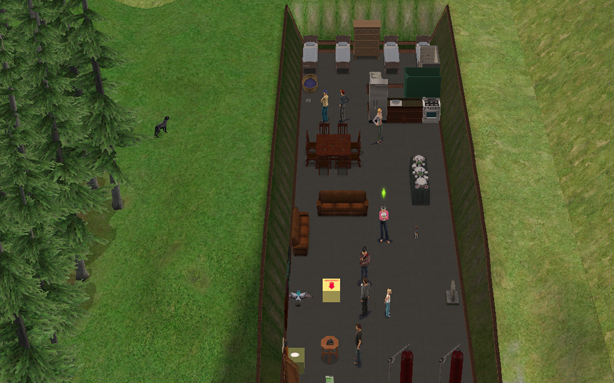 The walls were from Maxis, with childish cats and dogs bordering the tops, which I thought were simple and effective. The teacher desk sat in the left hand corner, with phone and laptop ready for work. There were also letters the children had gievn him for whatever reason. And a fisk tank. Perhaps they were learning about fish on the cirriculum. Or responsibility. and a play area on the other side which featured some of the children’s paintings. These were barely glimpsed in the video, but I still wanted it all there. There were windows only down one side of the room, as I imaged it to be one classroom inside a block of four so there would be uncreated classrooms on either side, and a little hallway area to which they exited. This is something I, er, forgot, when filming the children’s exit out of the door, but not something I was too worried about. For my first chapter, and my first film, I was quite happy with the result. That said, it wasn’t until Chapter 2 that I learnt some omore of the vital cheats required of film-making that would make the process of controling a bunch of sim children much easier – setaspiration, lockaspiration and motivedecay. There I was using the maxmotives cheat constantly, trying to make the kids happy while they still complained about aspiring to talk and be friends with children across the other side of the room… but it all worked out in the end. They even agreed to posing for photos at the end. 😛 Enjoy the class of 2B. B to F, L to R: Riley, Andrew, Damion, Jack, Josh, Alec, Waylon. B to F, L to R: Gabby, Sharlene, Kenya, Sharon, Natalie, Danielle, Kay, Kate.